“Re-use, Renew and Build Green” was the theme for this client’s new cottage on a beautiful waterfront lot in the Pacific Northwest. The cottage was to replace an existing cabin that had occupied the site for years and held many fond memories for the family. We worked together with the architect and client to carefully create a new 3200 sf residence, which carries on the small-scale, informal cottage legacy. To be environmentally friendly, we incorporated as many sustainable features as were feasible and practical. This drove every choice and selection made for the cottage. From the building materials to the finishes and interior furnishings, Natasha Wallis Design was instrumental in pulling the look and the feel of the project together. One critical and key expectation of the project was to reuse the family’s existing furnishings: a collection of heirlooms, hand-me-downs and various inherited pieces. To pull together the interiors, furniture plans were drafted early using carefully documented photo journals of the various items. This vision helped identify which objects could be used as is, which objects needed repair and how to give new life to the old and cherished. Fabrics, paint and artwork would be the thread used to pull the rooms together. The memories and histories of these family pieces helped to create a warm, welcoming environment that reinforced the informal, cottage notion. 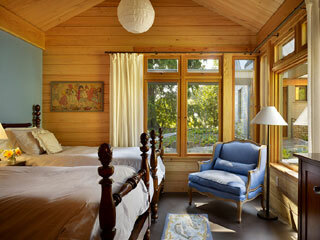 The cottage is a testament to the passion and commitment of the clients to build green. They are patrons of this movement and it was a complete pleasure to have the opportunity to be a part of the process. 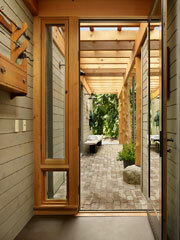 The home is LEED Gold Certified and a 2010 National Award Merit winner. Green features include: FSC-certified building materials, ground source heat pump, photovoltaic, solar water heating, rain garden storm water control and a high level of environmentally friendly materials. 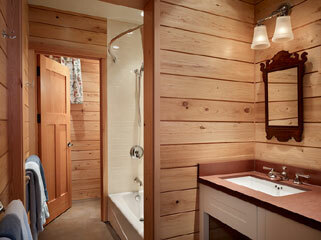 The inviting exterior and interior paneling was sourced from windfall trees. Reclaimed wood beams and locally sourced wood posts, stone, and recycled bricks provide the frame. The historic cottage stove was refurbished and is a prominent feature of the new kitchen. Interior finishes include low and no VOC stains and paints. Local trades created sinks, tiles, countertops, and benches. And, the beautiful kitchen island countertop is crafted out of local Madrone wood. 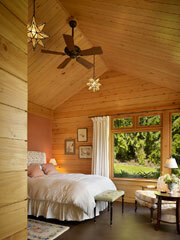 The home features artwork and crafts from local and regional artisans.